Based out of Cincinnati, Ohio, and comprised solely of Andrew Lampe, THE WAKEDED GATHERING have released the acclaimed debut album “Tenements Of Ephemera” in 2010 as a pro-printed CD-r limited to 100 copies, and later also as a tape co-produced by Dark Descent Records and Skeleton Plague Records. 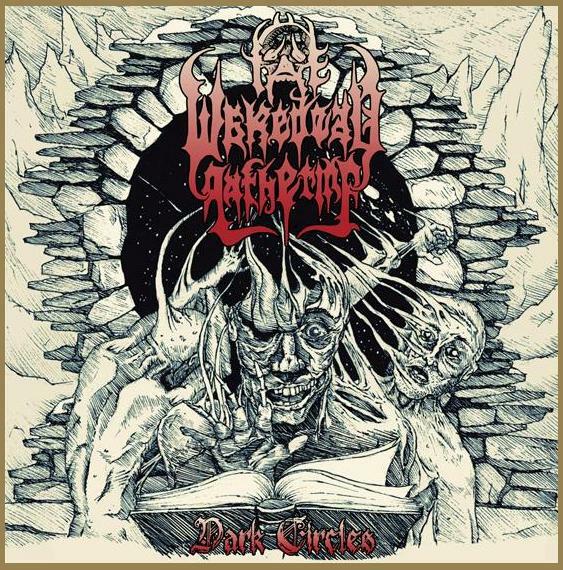 While waiting for a definitive CD edition of “Tenements Of Ephemera” as well as for a new full-length album under the banner of I, Voidhanger Records, THE WAKEDEAD GATHERING vomit out a new 5-track EP of obscure Lovecraftian death metal aptly titled “Dark Circles”. Wrapped in an ominous cover artwork representing a flesh-eating gate opened to infinite voids, “Dark Circles” follows the same path of the debut, reviewing in a very personal way the early Incantation / early Immolation canons, this time with even more emphasis on crushing raw sounds, rhythmic changes, dark twisted melodies, and cosmic horror atmospheres. Now leave your mortal remains behind, enter the dark circle, and inhale the eclipse!